Need new wheels? 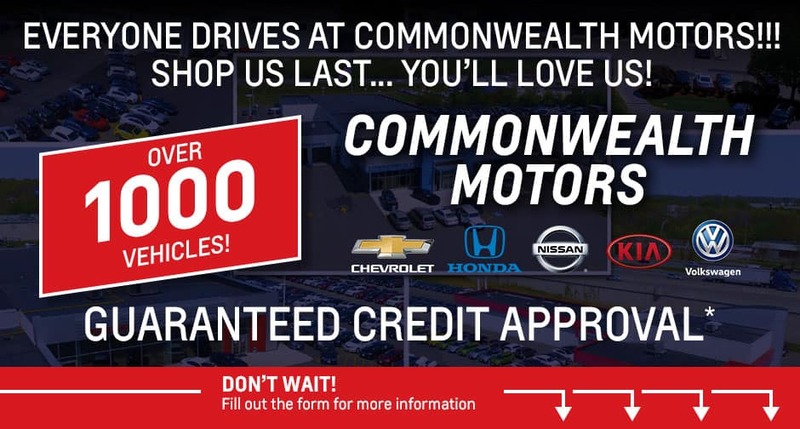 Get yourself over to Commonwealth Motors! We have over 1,000 new and used vehicles, including brands like Chevy, Kia, Nissan, Honda, Volkswagen and more. Don’t worry about any credit problems—helping people with credit issues is our specialty. In fact, we can guarantee your credit approval*! Drive away in your brand new ride today. Call (978) 965-8223 or fill out the form on this page for more information. Everyone drives at Commonwealth Motors! We can help you get approved, regardless of your credit history. Shop our wide selection of new and pre-owned vehicles to find the perfect ride at an affordable price! With our guaranteed credit approval*, you’ll be able to drive away in your new car without the stress and hassle. Visit our location today—you’ll love us! *With approved credit through Credit Acceptance Corporation. Must provide down payment, proof of income, proof of residence, five personal references, and proof of insurance. Some vehicles excluded. See dealer for complete details.